Background: Oilseeds are major sources of calories for human consumption and have a significant agricultural and industrial value. Seed number and weight are the two main components of seed yield. In plants, plastidial isoprenoid derived hormones (e.g. 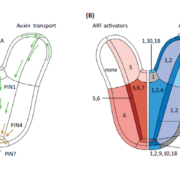 cytokinins [CKs] and gibberellins [GAs]) regulate growth and development and thus seed number. In oleaginous species, fatty acids (FAs) and proteins are major contributors of the seed dry weight. The metabolic pathways involved in the synthesis of these compounds use glycolytic intermediates as precursors. The plastid-localized phosphoglucose isomerase (PGI1) is involved in early steps of glycolysis and thus, may be involved in the production of precursors for plastidial isoprenoid-derived hormones and storage reserves. However, no direct genetic test of the role of PGI1 in these processes has been conducted. Question: We wanted to investigate if PGI1 is an important determinant of Arabidopsis seed yield. 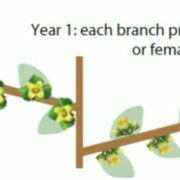 We tested this by investigating the expression pattern of the PGI1 gene and characterizing PGI1 null pgi1-2 plants at the external phenotype (number of inflorescences, siliques and seeds per plant; flower and seed morphology) and metabolic (shoot GA and seed FA and protein contents) levels. Findings: pgi1-2 plants had much lower seed yields than wild type (WT) plants. They produced fewer inflorescences, and thus fewer siliques and seeds per plant. These traits were associated with reduced contents of bioactive GAs in shoots. In addition, pgi1-2 seeds were lighter and accumulated less FAs and proteins than WT seeds. The expression pattern of PGI1 was very similar to that of genes encoding GA and CK biosynthetic enzymes. 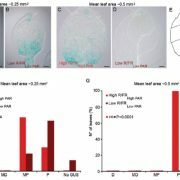 Our results show that PGI1 is an important determinant of Arabidopsis seed yield due to its involvement in two very different and apparently unrelated processes: GA-mediated reproductive development and the metabolic conversion of plastidial glucose-6-phosphate to storage reserves in the embryo. 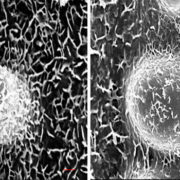 Next steps: We are investigating if primary carbohydrate metabolism and secondary isoprenoid metabolism in plastids are co-regulated via PGI1-mediated mechanisms that harmonize synthesis of isoprenoid-derived compounds with carbon supplies. In other words, we are investigating if PGI1 acts as a metabolic sensor and regulator of the synthesis of plastidial isoprenoids (and thus growth, development and metabolism-related processes). Abdellatif Bahaji, Goizeder Almagro, Ignacio Ezquer, Samuel Gámez-Arcas, Ángela María Sánchez-López, Francisco José Muñoz, Ramón José Barrio, M. Carmen Sampedro, Nuria De Diego, Lukáš Spíchal, Karel Doležal, Danuše Tarkowská, Elisabetta Caporali, Marta Adelina Mendes, Edurne Baroja-Fernández, Javier Pozueta-Romero (2018). 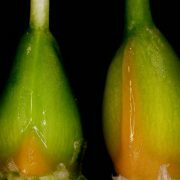 Plastidial Phosphoglucose Isomerase Is an Important Determinant of Seed Yield through Its Involvement in Gibberellin-Mediated Reproductive Development and Storage Reserve Biosynthesis in Arabidopsis. 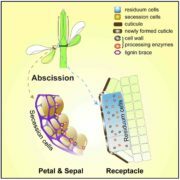 Plant Cell 30: 2082-2098; DOI: https://doi.org/10.1105/tpc.18.00312. 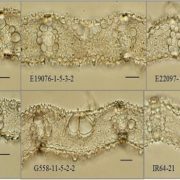 Featured image shows expression pattern of PGI1 in different plant tissues. 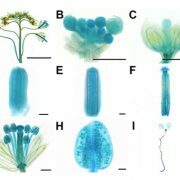 Key words: Seed yield, fatty acid biosynthesis, gibberellin biosynthesis, plant development.